Xeogaming Forums -- General Chat: Happy That Time of Year Again! I saw this and was like... oh right, it's October already. Now I am just waiting to see what happens when Kaleb notices the thread I am in since his computer is next to mine... my laughter might wake the neighbors. I take all the blame! The links are misbehaving again, Rogue. Also, his reaction was not as good as I hoped, but it was still funny. He was talking and looked over, then noticed the thread and just sort of trailed off with a confused look before asking "What is that?" Photobucket was down for the better part of a day, but it's finally up again. It's also getting the overflow of gifs that aren't working on my Tumblr, so hopefully these stay up, else I'm going to have to find a third hosting site. 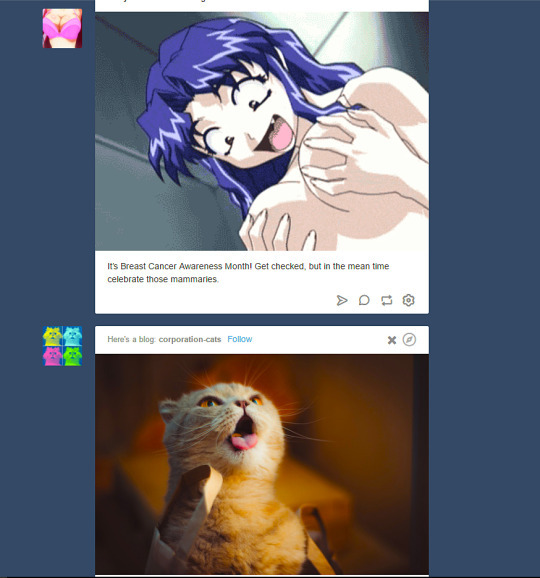 Scrolling through my Tumblr, where they keep insisting on dropping in other people's posts, unsolicited, it's funny that I got this on the feed. EDIT: It seriously censored this picture? Here it is again through the magic of Tumblr. The cat just makes that picture. Honestly that is amazing.